Pillansia is a monotypic evergreen cormous genus in the Iridaceae family native to Western Cape Province, South Africa. It is in the Watsonieae tribe. Pillansia templemannii has linear leaves without a midrib and flowers in a panicle instead of a spike. 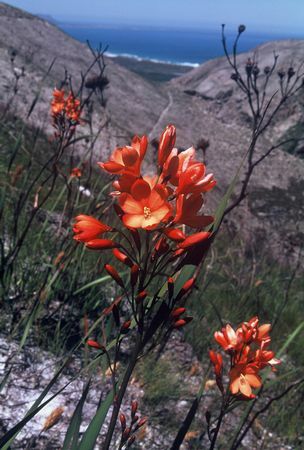 It has orange bell shaped flowers and grows in nutrient poor sandstone soils or in seeps. It rarely flowers except after the surrounding vegetation has been burned and then it flowers in mass. It does not respond well to cultivation. Photo by Rod Saunders.